I don’t know why I would expect this year’s weather to be any better for getting our hay-field cut and baled in a timely manner compared to the previous five summers. It’s past the middle of July and we are still waiting on the neighbor who volunteered to tackle the job for us. All the mowing I did last year to discourage weeds and give the grass a boost looks to be marginalized by the vast number of new weeds reaching maturity out there today. I had hoped the field would get cut in June while I was on my bike trip, but Cyndie reported rain almost every day I was gone. Then there was the 4th of July holiday week, followed by more days of rain. The window of dry weather this week is very short, but Cyndie spoke with our neighbor and he confirmed our field is still in his plans. I expect he needs to get his fields cut first. When I got home yesterday, I spotted him cutting a field on the corner. Finally, last night we heard the tractor in our field. By the time I got out there to witness the scene, he had cut three passes inside the fence and was driving away down the road. Did something fail on his equipment? Did he just run out of time? We’re hoping to talk with him later this morning to learn his status. From the looks of the forecast, more rain is expected on Thursday. This doesn’t leave much time for drying, based on my understanding of the process. At least we have a spell of dry Canadian air over us currently. That goes a long way in determining how quickly the cut grass will dry. Last week’s mid-70° dew point temperatures weren’t doing much toward helping anything to dry out. Meanwhile, we have already purchased and stored enough hay for the year, so we don’t actually need this as much as we simply want the field cut, and are hoping someone could use the bales. 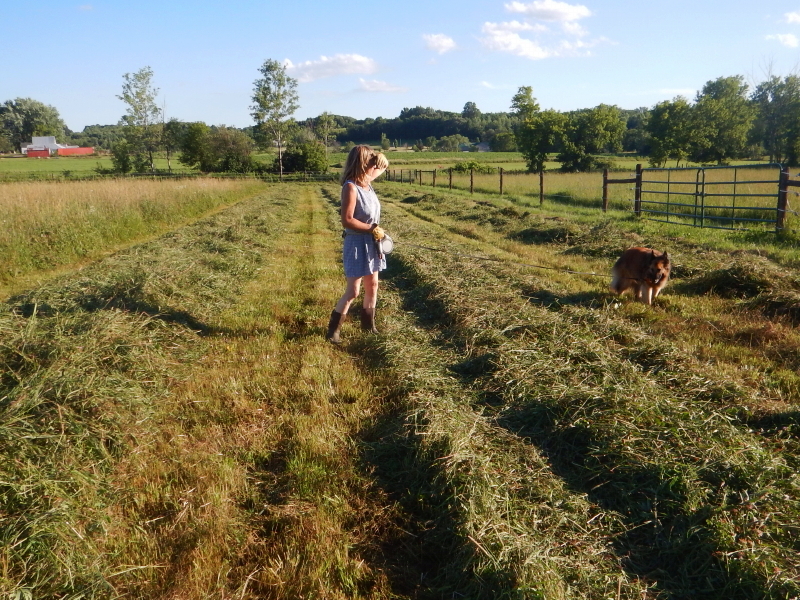 While walking the three freshly cut rows last night, Delilah was in her glory to investigate the scene. In no time at all, she had sniffed out the body of a decent sized rodent and consumed it faster than either Cyndie or I could react to dissuade her. That’s really queasy-making, I tell ya. Here’s hoping our neighbor’s barely getting started cutting last night will change over to completely finished by the end of today. Imagine how big the yurt will seem compared to the trailer, once you are able to move in! 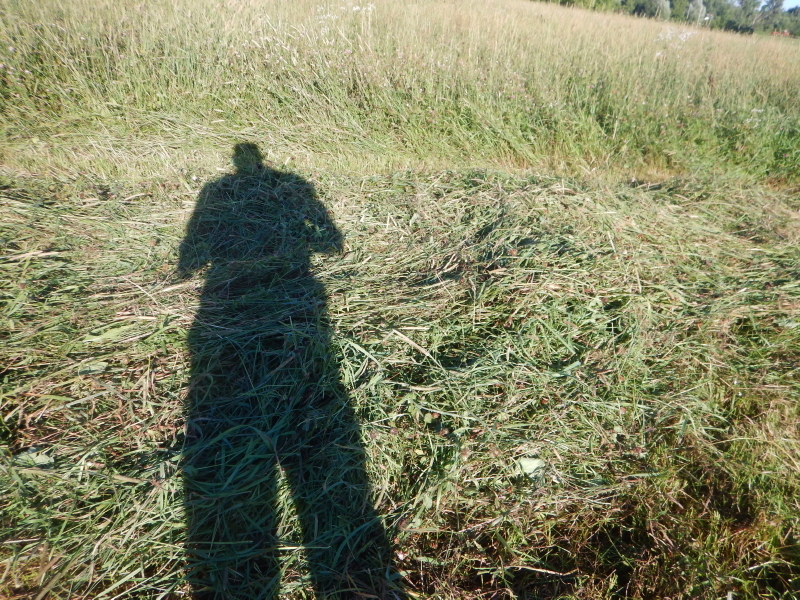 We just learned the neighbor stopped because he can only get that much baled before Thursday’s rain. It all makes sense! Happy he is managing things as best possible. Hopefully, your builders will win their battles with time and weather to provide optimum results for you guys on the yurt!